Guinea pigs are easy-to-care-for pets who are occupying an increasing number of households in America. According to "San Diego Pets" magazine, movies like Disney's "G-Force" have helped drive the species' popularity. Before you put your guinea pig on display at a pet show, prime him for the occasion. To prepare your guinea pig's coat for a show you will need to give him a bath. 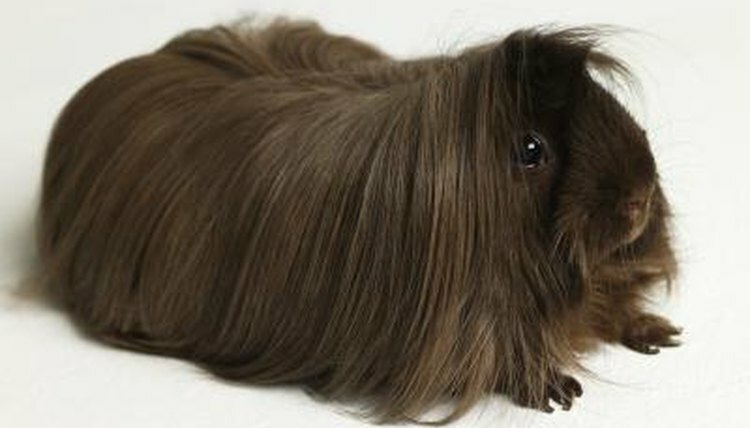 The Capricornia Cavy Club website recommends bathing your cavy a week before the show if he has short hair and up to two weeks before the show if he is among the breeds with coarse coats, which include the Abyssinian variety. The bath will help bring a nice shine to the guinea pig's coat within a few days because you have stimulated the natural oils in his hair. You can find a shampoo specially designed for small animals in most pet stores, and you can use a sink with a small amount of warm water as his bathing spot. Once your guinea pig has been bathed, the next thing you should do to prepare his coat for showtime is to dip him in a flea dip product. Doing this about a week prior to the show will help ensure that his fur is free of lice or lice eggs. You should consult your veterinarian about the type of dip products you can use on your cavy and the methods in which you should apply them for maximum safety and effectiveness. Guinea pigs need to have their nails trimmed to prevent them from growing in a curled pattern. Overgrown nails can poke into the pads on your guinea pig's feet and eventually cause infection. Nails should be short and neat. Because the process can result in accidental injury to a cavy if not done properly, you should have a veterinarian perform trim nails prior to the show. According to the Guinea Lynx website, monthly nail clippings will help keep the nails at a safe length and keep your pig accustomed to the clipping experience. Guinea pigs have what are called grease glands located on their rumps right where their tails would be if they had tails. Male cavys, in particular, secrete a scent and sticky substance from this dime-sized patch when they are courting a female cavy or fighting for dominance with another male pig. Before a show, it is your job to make sure this gland is clear of built-up grease by removing residue using a cotton ball and some eucalyptus oil, coconut oil or even Dawn dish washing liquid. Brush your cavy daily to remove loose hair and keep shedding under control. This is especially important if your pig has very long hair. Because he will be judged largely on his appearance, you can do some extra maintenance prior to the show by trimming his hair so it doesn't drag along the floor. Pay special attention when trimming around his backside, because that section could become matted from exposure to urine and feces.